Nothing says “family” like beautifully rendered beach portraits that will be cherished for decades. 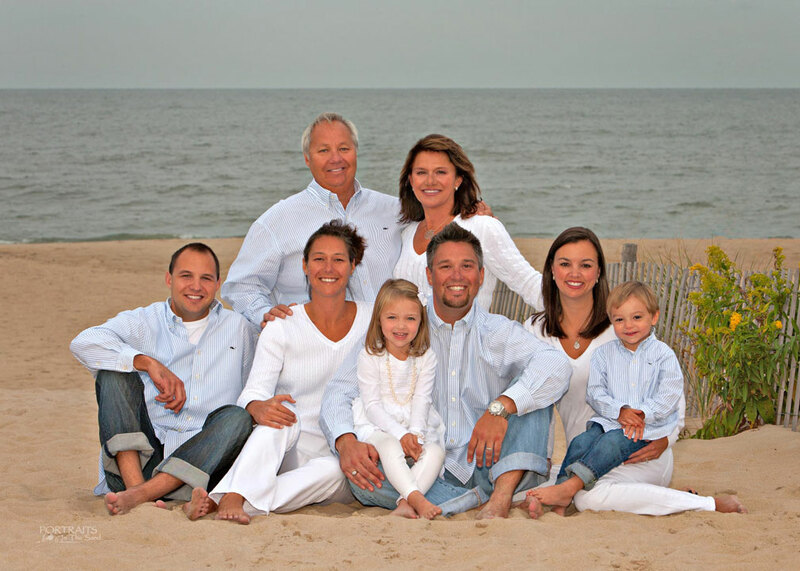 Framed by gentle waves, sand dunes, beach grass, and the eastern sky, your family never looked happier or more beautiful in the fine art portraiture of David Koster, owner of Portraits In The Sand. Only Portraits In The Sand produces high-quality, artfully-composed family photographs set against the beauty of the seashore. Schooled in photography, David has the creative talent and skill to consistently render beach portraits and on-location family photography that convey depth in the subjects and captures their personalities. Fresh, charming, even sometimes amusing, the beach portraits reveal the playfulness of a family, the relationships of cousins to one another, or the bond between a grandfather and his grandchild as they experience the outdoors together. His sizeable portraiture is created to be displayed in your home, adding warmth and a personal touch to your décor. Like all good art, the beach portraits’ aesthetics and interesting composition will stir feelings and elicit responses for generations to come. Portraits In The Sand Photography Studio is the Delaware Beach Portrait Specialist by nationally award winning Master and Certified Professional Photographer David Koster along the mid Atlantic beaches in Rehoboth Beach, Lewes, Dewey Beach, Henlopen Acres, Bethany, South Bethany, Ocean View, Sea Colony, Fenwick Island, and Rehobeth Beach, Delaware, DE, USA. Destination photography is also available throughout the country, Caribbean and abroad. Our photography subjects include families, couples, children, pets, high school seniors, dogs, individuals, engagements, anniversaries, reunions, groups, events, boats, photo restorations and more. "Dave photographed my parents for their 40 anniversary. It's a beautiful portrait and my mother still gushes over it! Wonderful job, Dave!" Ally W.
“I will cherish the beautiful and captivating portrait of me, my husband and our two children forever.” Dawn F.
Call 302-226-9226 to order by phone 9am-9pm every day. Reservation Special Price $250 or FREE: Please call us for more information.